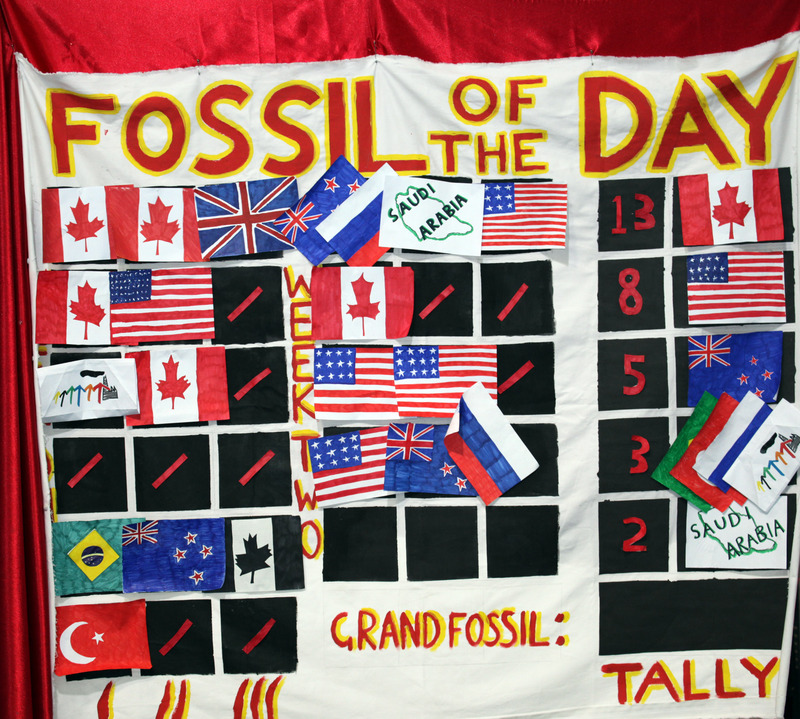 IISD Reporting Services (IISD RS) is producing daily web coverage and daily reports from selected side events. To download our report, click the HTML or PDF icons below. 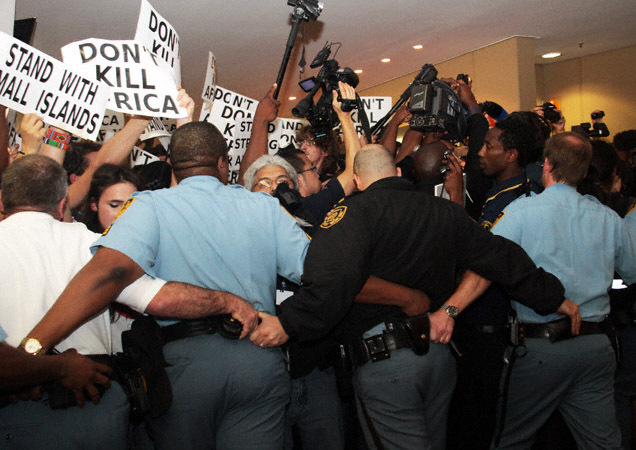 Protesters trying to push their way through the COP 17 negotiations. 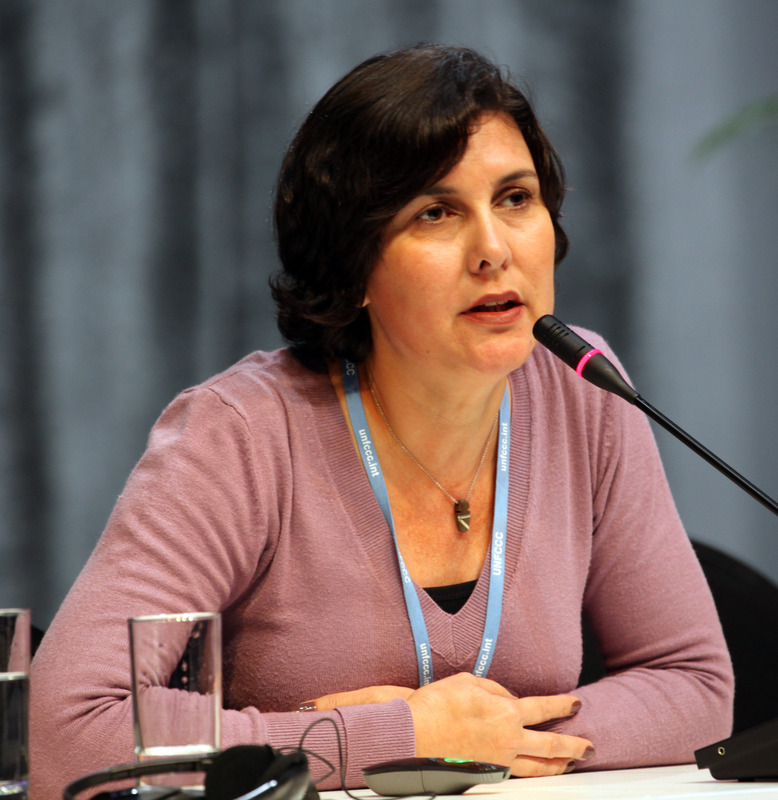 Márcia Soares, Fundo Vale, emphasized that it is entirely possible to bolster REDD mechanisms. 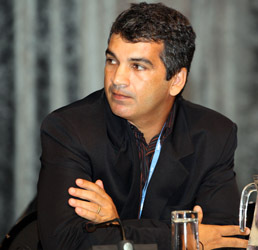 Renato Farias, Center of Life Institute (ICV), discussed the five components of approaching degradation and deforestation. 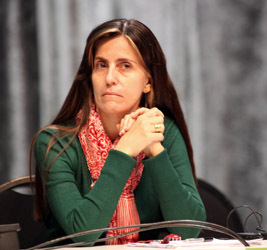 Elaine Corsini, Mato Grosso Environmental Agency, commended the decline in deforestation activities in the Mato Grosso region since 2004. 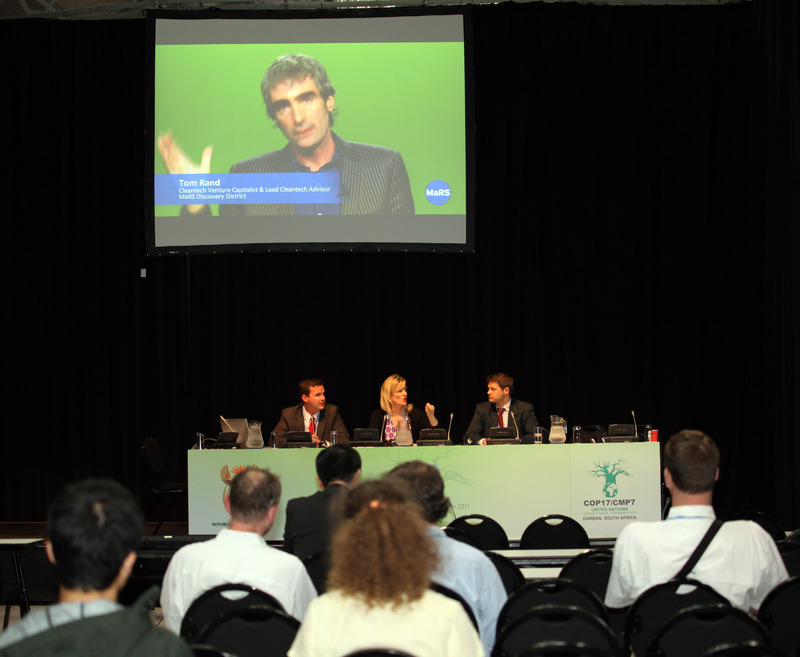 Laurent Micol, ICV, reflected on how to make REDD happen on the ground in the first nation frontier of the Amazon region. He quoted three priorities from Ban Ki-moon on sustainable forestry: effective commitments from governments; policy and decision advancement in REDD; and construction of practical solutions based on private-public partnerships. Renato Farias, ICV, shared preliminary results and lessons learned from the Cotriguaçu Sempre Verde project and its approach to reduce deforestation and forest degradation. 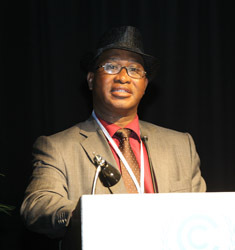 He spoke of the “always green” municipality plan that established five components to: provide the municipality with capacity and basic information infrastructure; foster good forestry practices through voluntary engagement of forestry companies and monitoring; encourage responsible practices in cattle ranching; establish sound natural resource management in rural settlements; and devise territorial management plans for indigenous lands. Damião Carlos de Lima, Cotriguaçu Mayor, talked about challenges of municipalities located in critical deforestation areas in addressing changes on the ground. He explained his municipality’s vision: total compliance with environmental legislation; forest cover of 80%; application of best agricultural practices in its one million cattle-ranching sector; and implementation of forest management plans of 380,000 hectares. Márcia Soares, Fundo Vale, told of experiences in green municipality initiatives to support sustainable development agreements on deforestation frontier areas and said their mission is to promote sustainable development while combining preservation and conservation of the environment. Elaine Corsini, Mato Grosso Environmental Agency, talked about the Mato Grosso State policies to reduce deforestation and to set a legal framework for REDD+ initiatives. She showed how the curve of deforestation of Mato Grosso in the Amazon basin has reduced dramatically since it peaked in 2004, and looked forward to further development and implementation of the proposed findings. Fernanda Carvalho, The Nature Conservancy, shared her views on the federal Brazilian efforts to contain deforestation and their initiatives at state and local level. 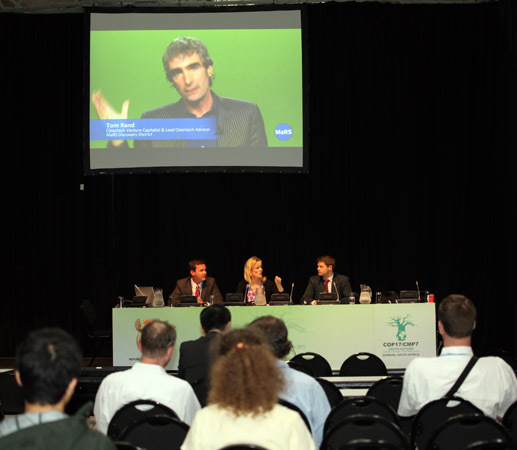 She applauded the large reduction in deforestation, and stressed the future focus will be at the municipality level. During ensuing discussions, participants questioned: development of REDD’s financial mechanisms in Brazil; land tenure solutions at municipal level; and rights-based approaches at ground level. 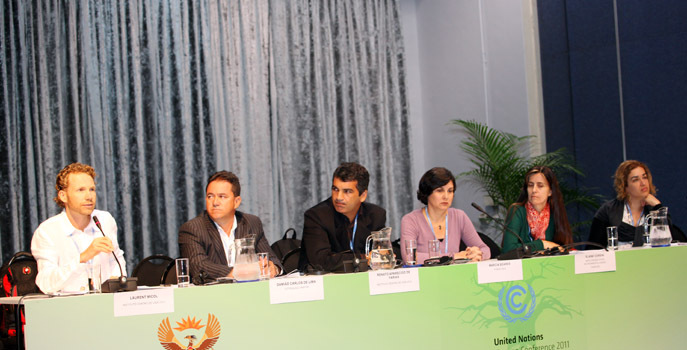 L-R: Laurent Micol, Center of Life Institute, Moderator; Damião Carlos de Lima, Cotriguaçu Mayor; Renato Farias, Center of Life Institute; Márcia Soares, Fundo Vale; Elaine Corsini, Mato Grosso Environmental Agency; and Fernanda Carvalho, The Nature Conservancy, applauded the successes of REDD at ground level in Brazil. West African Coastline: Who Bears the Brunt? Victor Fodeke, African Union Commission, Nigeria, asked participants to wake up to opportunities and turn crisis to opportunity. Arigbabu Sulaimon, HEDA, lamented the “blame game” occurring, while affected communities suffer. 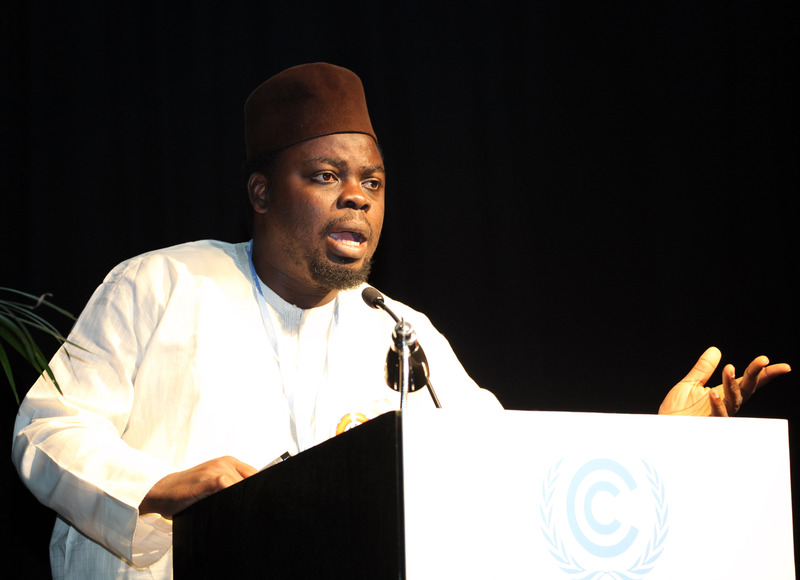 Arigbabu Sulaimon, HEDA, explained the need to bring global attention to abandoned ships and shipwrecks, identifying the implications on livelihoods, and the environment across West Africa. 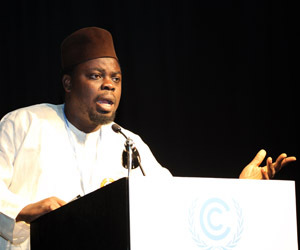 He shared a video made by the Lagos State Ministry of Waterfront Infrastructure Development, documenting the ecological challenges of abandoned vessels and direct impact to the economy such as: destruction to flora and fauna from corrosion; devaluation of tourism from degraded beaches; and responsibility of costs for removal. Highlighting impacts on coastal communities, he detailed the increased: potential for accident; effect on livelihoods; and challenge to engage in mitigation. He pointed to the failed restrictions from federal authorities to restrict ship abandonment, counting over 70 shipwrecks in Lagos. He explained that it has become common for ship owners to return to the country of registration and claim insurance rather than dispose of ships properly. He articulated the urgency to remove shipwrecks to further protect coastal communities, especially in facing climate change, a risk multiplier. Sulaimon posited that due to the international dimension of these challenges, the best way to regulate is through international mechanisms. He expressed disappointment that IMO did not join the event after they agreed to be on the panel, illustrating the challenge in collaboration. 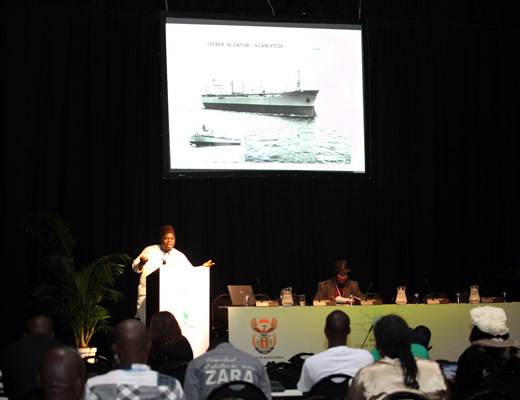 Victor Fodeke, African Union Commission, Nigeria, warned that shipwrecks potentiate disaster by causing accidents. He called for proactive actions to: map shipwrecks by marine archaeologists; improve communications along coastlines; and develop packages at local level to create bottom up strategies. He encouraged a shift in the paradigm regarding waste, referencing the Chinese character for waste is the same character used for opportunity. He suggested that the shipwreck challenge be brought into investment forums to direct dialogue toward opportunities that make money out of the crisis and improve poverty in coastal areas. Ensuing discussions reviewed issues such as: responsibilities for removal of shipwrecks to include owners of the ships; mobilization of voices and actions to increase awareness of dangers; development of strategies to get the government to act appropriately; integration with IMO; and opportunity for recycling abandoned ship metals. Okibe Richards, Ministry of Environment, Nigeria, assured the concern and interest of government as well as the willingness to assist. 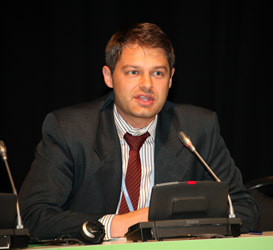 He suggested NGOs to develop programmes to apply for financing through the Africa Adaptation Fund that is now available. Panelists engaged with participants in discussing strategies to address the challenge of abandoned ships in West Africa. Aaron Leopold, Global Governance Institute (GGI), highlighted the importance of building a realistic partnership potential for new technologies. Jason Blackstock, CIGI, pointed out the need to integrate new technologies in addressing social needs. 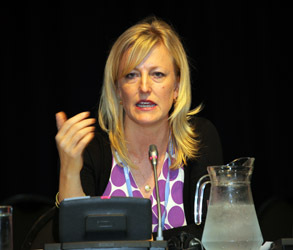 Velma McColl, Canadian Clean Technology Coalition, described the process of building next generation innovative technologies to low-carbon electricity. 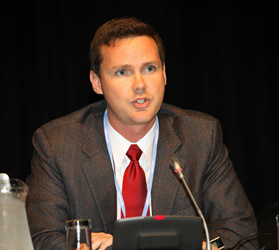 Jason Blackstock, Centre for International Governance Innovation (CIGI), talked about the 2011 WGSI Equinox Summit that took place in Waterloo, Canada, that mobilized an International, intergeneration and interdisciplinary group to explore technology pathways to a low carbon future. He outlined the core Summit ideas for low carbon electricity: long-term vision; mobilization of innovator networks; production and maintenance of a living blueprint for action; and all based on robust scientific knowledge. Velma McColl, Canadian Clean Technology Coalition, commended the WGSI Equinox Summit and the importance of integrating 2030 climate and energy policy frameworks to promote new low-carbon pathways. She said the Summit was an opportunity to discuss: baseload, rural electrification; electrified transport; and smart urbanization. She noted the importance of looking at a holistic approach involving: transforming technologies; implementation strategies and innovation in both policy and funding approaches. Technologies needed to be scalable and replicable. Tom Rand, Cleantech Venture Capitals, MaRS, joining by video, underscored the importance of creating 10 pilot scale enhanced geothermal projects around the globe for baseload electricity. He noted the obstacles to develop such technology and the need to de-risk the technology to foster private sector investments. Aaron Leopold, Global Governance Institute (GGI), highlighted 2.5 billion energy-poor people and noted that poor African consumers have a higher willingness to pay for having access to energy – however they lack access to reasonable options. He underscored the benefits of organic photovoltaic energy coupled with light-weight batteries. He also talked about how to create markets to create a technology pull and bring down the price point for the energy poor. He imagined these energy technologies leapfrogging old approaches the way cell phones have had rapid and mass adoption in developing countries. Panelists discussed the need to create technology solutions that are scalable and replicable. 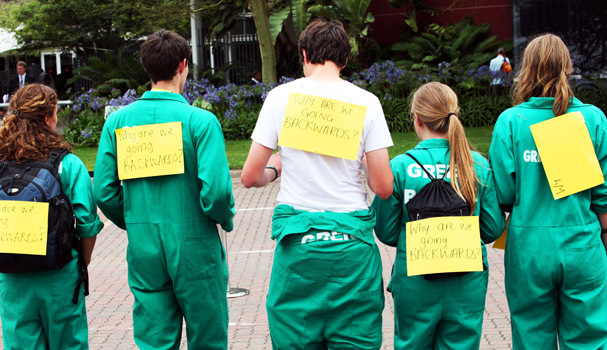 UNFCCC COP 17 youth participants from South Africa protesting at the conference center. 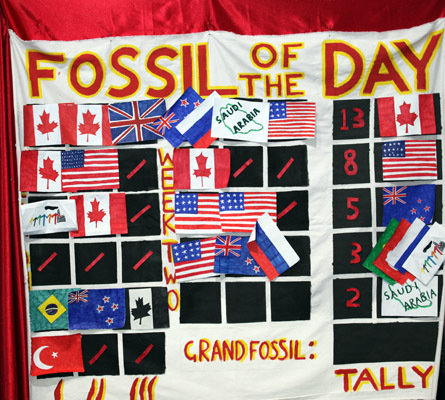 Final tally of the Fossil of the day.